BJ Ryan is currently on the Disabled List due to Tommy John surgery. This is due to BJ Ryan's extremely poor pitching mechanics. 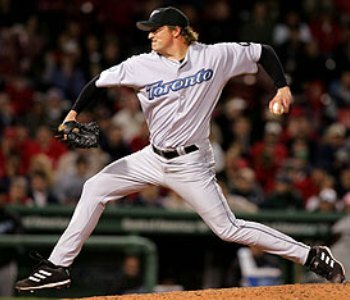 In particular, BJ Ryan may have the worst arm action and Timing I have ever seen; even worse than Chris Carpenter, Mark Prior, or Kerry Wood. A pitcher's arm action and Timing are the primary determinants of the long-term health of their arm, so it's always the first thing I look at. BJ Ryan's arm action is terrible, as the clip below demonstrates. 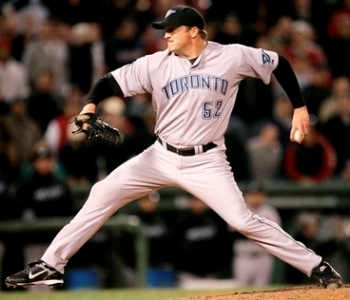 The problem is that, like Chris Carpenter and Kerry Wood, BJ Ryan has a major Inverted L in his arm action. You can see BJ Ryan's Inverted L at Frame 21 of the clip above. 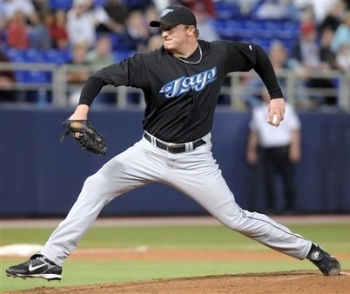 This completely destroys his Timing and is the root cause of his elbow problems. It will also set him up for Rotator Cuff and Labrum problems in a year or two. BJ Ryan's Inverted L is a little bit easier to see in the side views above. The thing to notice is how his Pitching Arm Side (aka PAS) elbow is at the level of his shoulders and his PAS forearm is hanging down vertically beneath it. This will increase the distance over which, and the force with which, BJ Ryan's PAS upper arm will externally rotate, which will put significant stress on both his elbow and ultimately his shoulder. The other day I came across two recent photos of BJ Ryan which tell me that he hasn't modified his mechanics since coming off Tommy John surgery. Instead, he still has a significant Inverted L in his arm action. As a result, he is at a significantly increased risk of shoulder and elbow problems.